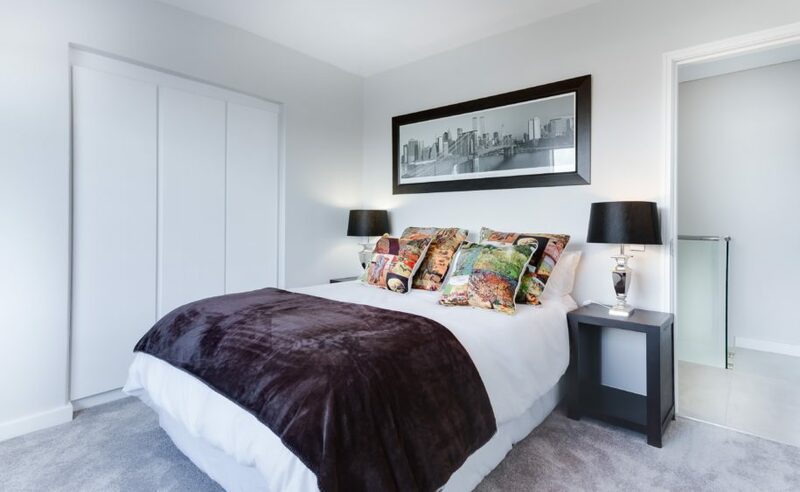 We spend nearly one-third of our lives with our head on a pillow, yet when the time comes to buy a new one, we seldom give more than thirty seconds of thought to our purchase. Many of us have developed a preference for pillow thickness (thin vs. fluffy) and firmness (supportive or soft), but far fewer have stopped to consider how their pillow can promote (or hinder) proper sleep posture. At Apple Healthcare, we offer three different pillow options that can help you get a restful night of sleep without wrecking your back and neck. Side sleeping on flat pillows is a fast ticket to neck strain. If the pillow is too thick, your neck will be bent upwards to accommodate your head position. If the pillow is too thin, your neck will be attempting to hold your head up. Even if your flat pillow thickness is “just right,” your neck still has a curve between your shoulder and head that leads to a lack of support for the neck. The Tri Core Cervical Pillow has a middle cutout section with a raised edge that perfectly supports the neck without placing the head in an uncomfortable position. Keeping your spine, neck and head aligned can help you get a better night’s sleep and reduce fatigue, headaches and neck pain. The Tri Core Cervical Pillow is made of a springy, supple fiber the allows the pillow to form to the shape of the head and is covered with smooth cotton to offer a premium comfort. A variety of sizes are available to match your body size and shape. 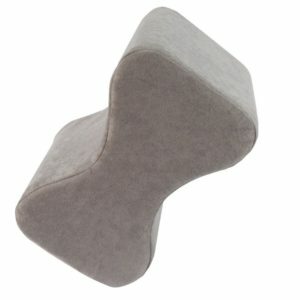 This unique design incorporates two shapes into one pillow. The center section of the pillow is designed for back sleeping with a wedge for upper back support. When you roll to your side, the raised edge supports your neck and the indented middle allows for a comfortable head position. 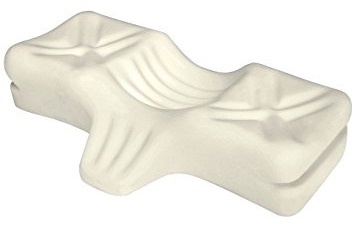 This provides benefits similar to the Tri Core Cervical Pillow for side sleepers (less fatigue, headaches and neck strain) while also offering support for back sleepers. 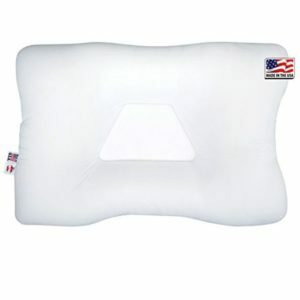 The Therapeutica Sleeping Pillow is made from a non-allergenic, non-toxic foam, with a unique density that provides support while still feeling soft. A removable, washable cover makes cleaning easy. It comes in five sizes to fit your body precisely. If you’re one of the 70% of people who sleep on their side, you may have never considered how your legs are positioned while sleeping. Sleeping on your side with your legs together (one on top of the other) can feel fairly comfortable for a while. Over time, however, this position can cause pressure on your joints and hinder circulation in your lower extremities. Imagine yourself standing straight up. Your legs are not pushed together, but instead have a slight gap which allow your feet to sit about shoulder-width apart. When you’re standing, the position of your feet determine the width of your legs and hips. Now rotate the whole thing 90 degrees (from standing to on your side). The feet no longer provide the anchoring to set a proper gap between your hips and legs. This is where a leg spacer comes in handy. It keeps a consistent, correct distance between your legs while sleeping on your side to relieve strain on your low back and hips. It also provides optimal placement for the knees and ankles. The leg spacer is made of comfortable, high quality foam and covered in a removable, washable fabric cover. Call us at 865-769-9685 to schedule an appointment with our chiropractic staff today. We can help you choose the right posture-supporting pillow and recommend other products as well.